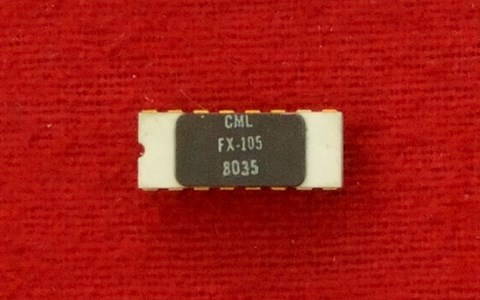 The FX105 is a monolithic CMOS tone detector for tone decoding in single and multitone signalling systems. By using phase locked loop (PLL) decoding techniques, the FX105A recognises tones in the presence of high noise levels and strong adjacent channel tones. Detection frequency and bandwidth can each be independently adjusted. The design is immune to high levels of harmonic and sub-harmonic noise. It also maintains excellent noise immunity and constant bandwidth over a wide range of input signal levels. The FX105 implements a frequency detector with a phase locked loop (PLL) and a lock detector. The voltage controlled oscillator (VCO) centre frequency, detection bandwidth, the loop filter, and detect filter are all independently controlled by external components. The FX105 provides a pair of pseudo-sinewave multipliers for splitting the input signal into approximately orthogonal components. These multipliers are implemented with commutating filters (cyclically sampling filters) which translate an in-band AC input signal to DC. The commutating loop filter is used as the phase detector of the PLL while the commutating detect filter provides for lock detection. Each pseudo-sinewave has a cyclic form (1 1 0 -1 -1 0) to eliminate low-order harmonic responses. The loop filter produces an error signal, which when applied to the VCO input allows frequency locking. A limiter between the loop filter output and the VCO input provides tunable control of the detection bandwidth (BW). Once achieved a lock the "detect filter" produces a DC value proportional to the tone amplitude; an internally generated reference is compared to the detect filter output to determine whether the PLL is locked to an input tone. Once a lock is determined, the internal reference is reduced by 50% to minimise output chatter with marginal input signal levels. The sampling clocks of the "detect filter" lag those of the loop filter by 60°. 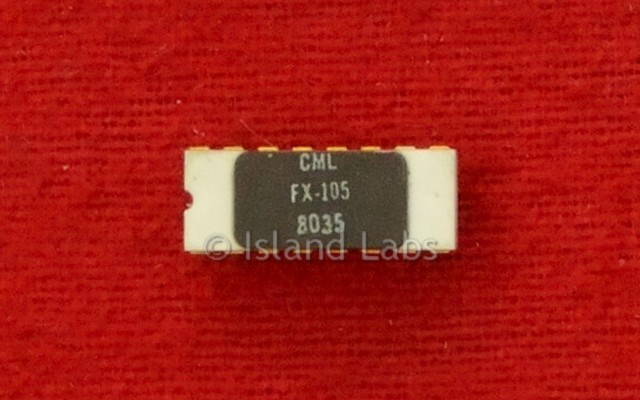 For improve the performance of the FX105, a capacitor can be used to phase shift the input to the loop filter by 30°. This shifts all sampling clocks an additional 30°, to phase align the detect filter sampling clocks with the amplitude peaks of the input tone.